This may be one of my favorite DIY projects yet. Super cheap (less than $20), pretty simple and a result that is not only functional but makes a big statement in the room. Here was my inspiration for the ladder found on Pinterest, originally from Better Homes & Gardens. And here is our DIY-version in the newly remodeled guest bathroom (sharing big bathroom reveal later this week). Update: Bathroom revealed here! 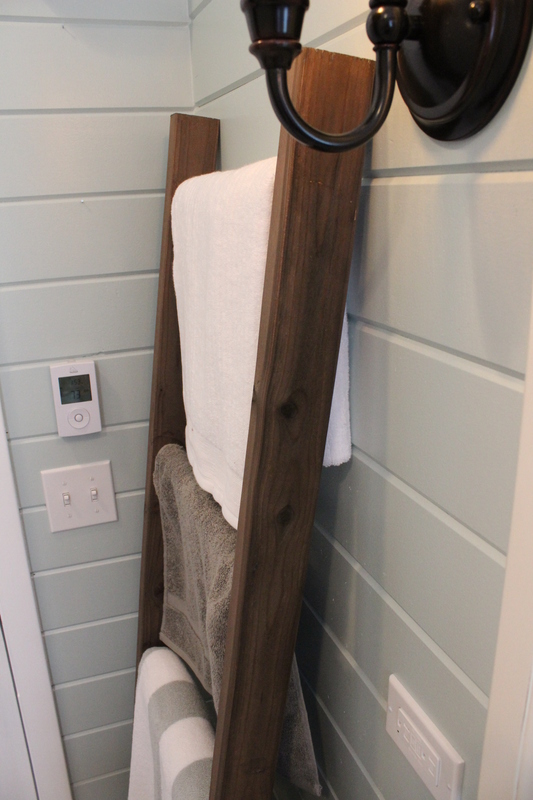 Not only does it work great for towels, but I’ve seen ladders used to hang blankets in living rooms and I love that use too. So if you are wondering how to make one of your own, here is a step by step, including giving it the weathered, rustic look. You will need to gather/purchase the following materials that should be around $20 or less. 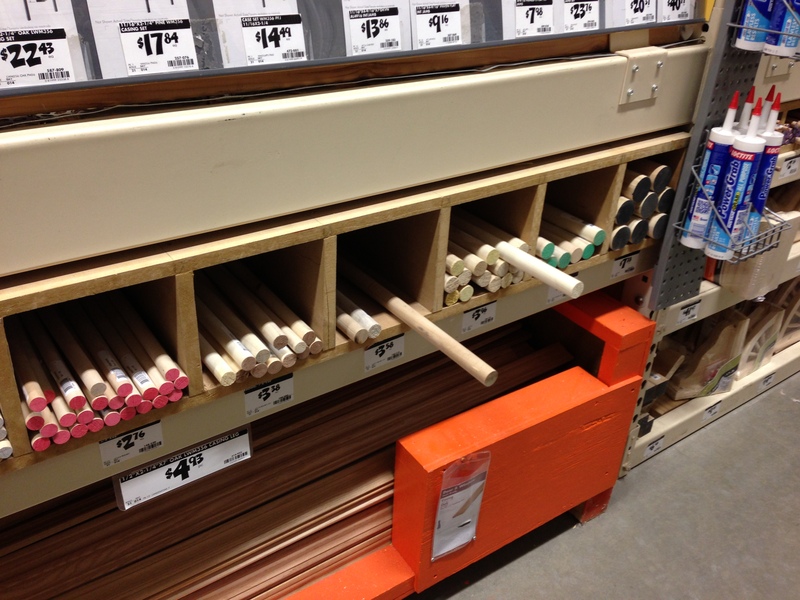 We had everything but the lumber on hand so ours was $16. Step 2. Make weathering solution 24 hours before. 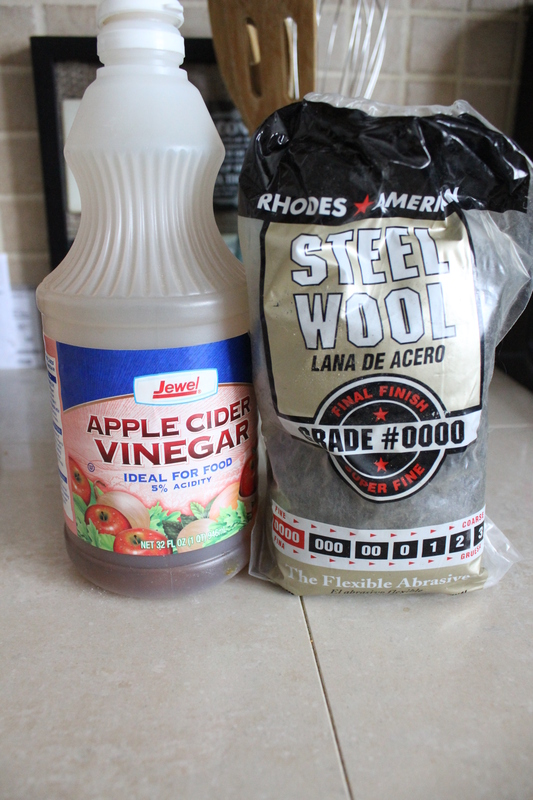 Take a handful of very fine steel wool and mix with vinegar in a glass jar. The steel wool will start to dissolve but won’t dissolve completely. 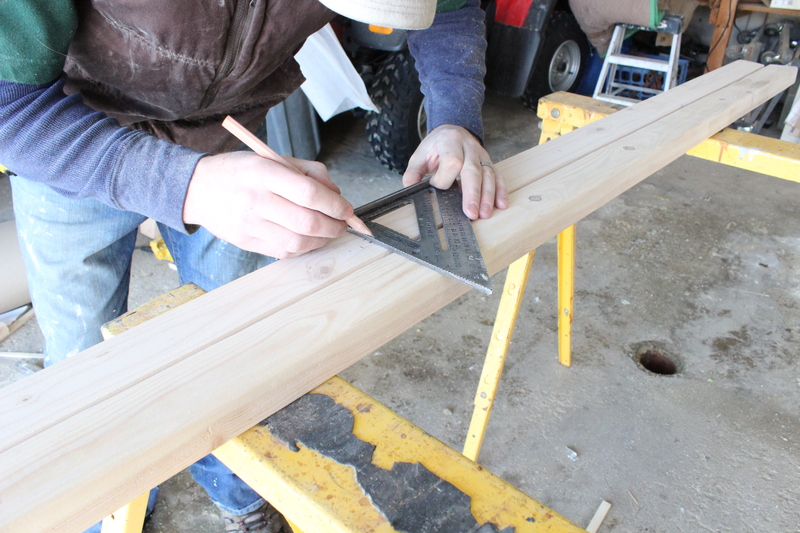 Wait at least 24 hours before applying to your wood. Step 3. Make your cuts. 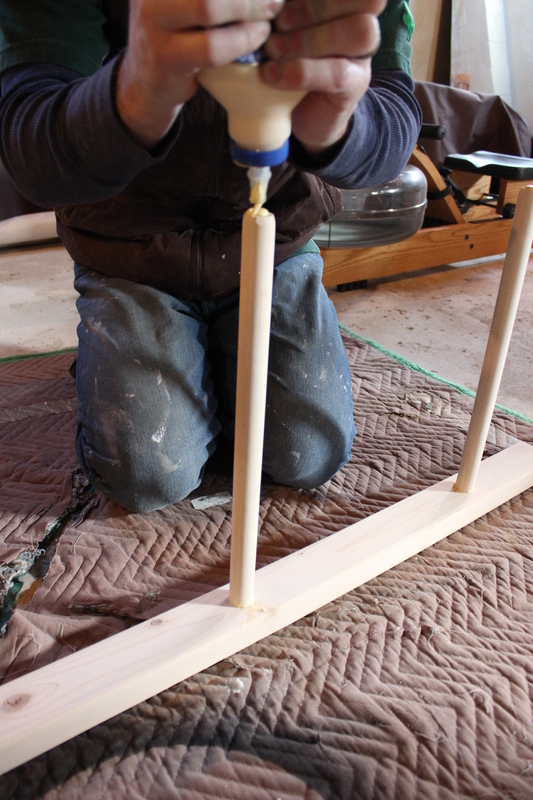 We cut the dowel rods into 5-16″ long rungs and cut down the 2x3s to 6 feet long. Step 4. Sand your wood. We used an electric hand sander but you could also do it by hand. Step 5. Mark sides for holes. We started our first hole 2.5″ from the bottom and then spaced them 13.5″ apart from the centers. Make sure your marks align perfectly on both sides. Step 6. 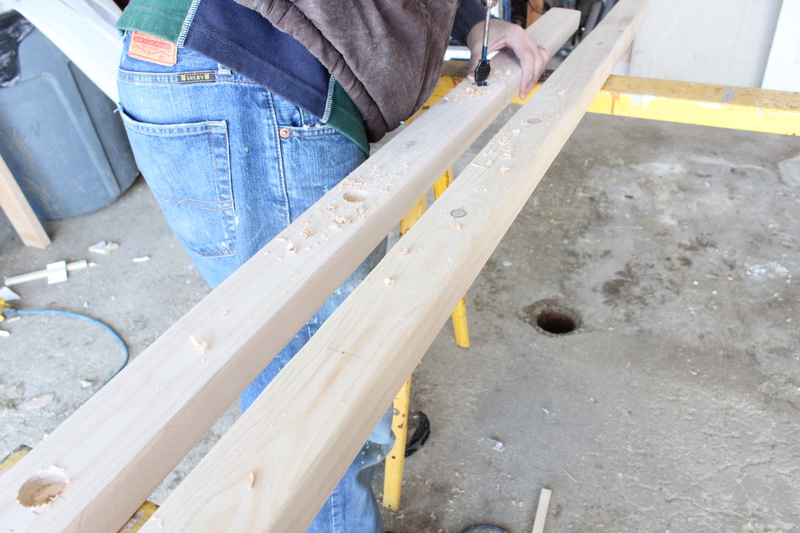 Drill 1″ wide holes that are 1/2″ deep. We placed a piece of tape 1/2″ up the drill bit to know how deep to go. Also go over holes with a light sand to smooth out rough edges. Step 7. 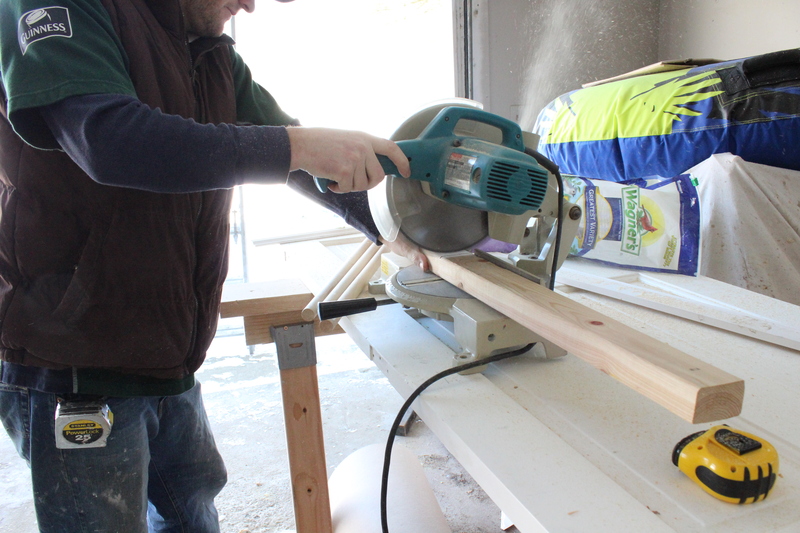 Sand down edges of your rungs to ensure they will fit into the holes. Step 8. 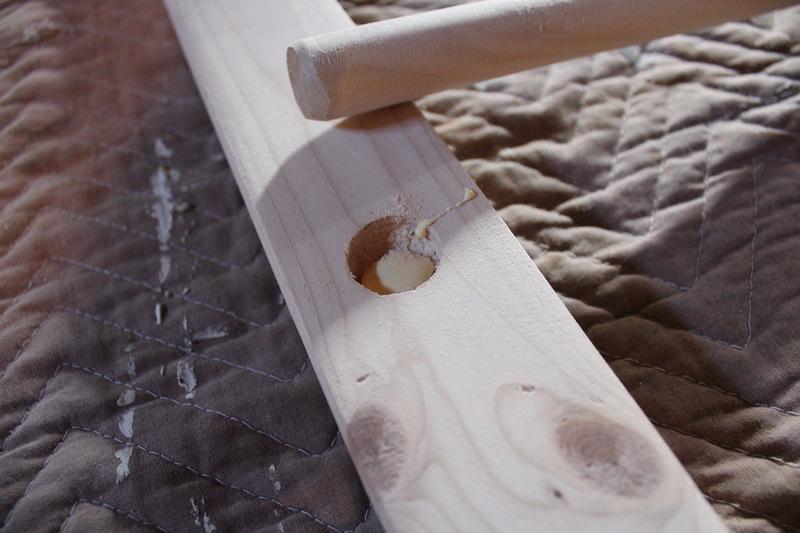 Fill one side of holes with wood glue and place rungs in. Step 9. Put glue on other side of rungs and place side onto rungs. Step 10. Attach clamps for at least 2 hours to dry. Wipe up all access glue. Step 11. Brew some very strong tea and brush it on your ladder. Apparently the tea releases tannins in the wood which allows it to oxidize from the vinegar/steel wool. 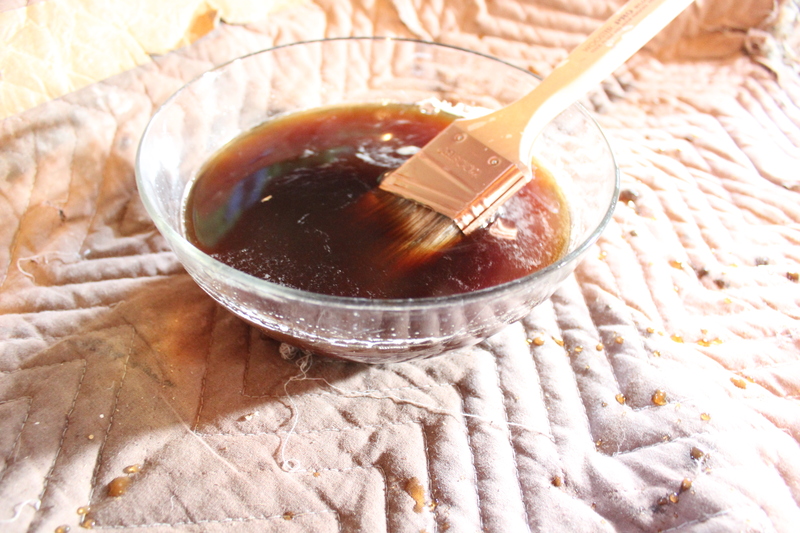 We coated ours with tea twice, letting it dry in between coats and before the next step. Step 12. Your final step! Brush on your vinegar/steel wool solution. It will start to turn the wood darker as soon as you brush it on and within an hour or so will be completely weathered. I couldn’t believe how well the weathering process worked and without buying expensive stains or paints. Just household items. What do you think? Worth $20 and a couple hours of time? I’d say so. ← Operation New Bathroom Part III- Almost Complete! We LOVE this ~ and I can’t believe you used a simple tea solution for the stain! The weathered look turned out great! We’re a huge fan of vintage ladders, but the good ones can cost a small fortune ~ I’m thinking this will be an awesome diy instead!! Thanks so much for sharing! Yes I looked on Craigslist and a few places and they were $80+ dollars. DIY is the way to go for sure! Thanks! I love this ladder – great job! I like that you were able to do it on the cheap and with household items. I may need to use your tutorial for the next Pinterest Challenge. Thanks so much! Would love to see your version on it if you do it too! This is so cool and I can’t believe it was only $20!! Thanks for linking up!! Pinning this! I know, right? Can’t beat the price. Thanks so much Megan! Good luck Kathleen! Thanks for visiting. Hi Amanda! I found your post and and I LOVE the ladder! Have just followed your steps and patiently waiting for the vinegar/steal wool to be ready to use. My steal wool doesnt really seem to be disolving and I am just 6 hours shy of 24 hours. Used the exact brand as yours so wondering if this is a problem. Thoughts?? Hi Leslie- Sorry to hear you are having an issue, did you use just a small amount of the steel wool? Has the vinegar turned color? You might just need to give it some more time. My husband had me put in a “pad” of the steel wool which I thought might be a bit much BUT it is what “we” put in. I used apple cider vinegar so it is a little difficult for me to tell if the color has turned. It doesnt look as dark as yours though. Did you use the fine steel wool like I showed? Then you break it up so its not in a big pad or clump. Yep – used the steal wool pictured but I wonder if I didnt break it up enough. I will go try that and then wait another 24 hours if you think that would help. Yeah try to really pull it apart. Hope it works better for you this time. I so wish I had a bathroom big enough for this! Our bathrooms right now would result in having to side step the ladder to pee. BUT…I am totally pinning for future spaces….or maybe in the living room for blankets. Thanks for the detailed instructions. Yes I would totally do it in the living room for blankets! We were lucky to have the perfect spot for it in our bathroom. Great job! We have an old bunk bed ladder that we found from the old owners of our house in the attic. We will have to do this for blankets or towels. My husband and I will be doing this project this weekend! We’ve had all the local antique shops on the look out for a year! And I even like this one better – THANKS! Great to hear Amanda. Hope you love it as much as we love ours. Thanks so much for stopping by! I love your steps for creating a towel ladder. I’ve been looking on-line for a towel ladder and can’t find one for the right size and I came across your pin. So, this seems a lot cheaper and I can get exactly the size i want!! I plan to tackling this project in the upcoming weekends and had a question for you. I like the idea of using tea and vinegar instead of a stain purchased from the store. I was just curious if you’ve had any problems with the tea stain fading onto your towels? I plan to use this towel ladder as my main towel rack so will be placing damp towels on it and wasn’t sure if you had experience with the tea stain color transferring to the towels? Wasn’t sure if you would recommend sealing the wood? 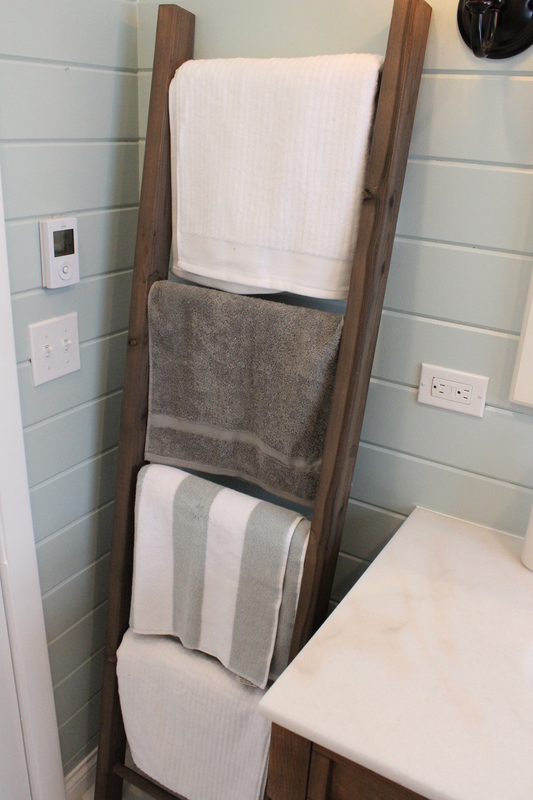 i can’t wait to create my own towel ladder! Thanks in advance for your thoughts and sharing your experience! Hi Janet- So glad you are going to make this. My towels haven’t been stained but I haven’t been hanging damp towels on it either so you might be better safe than sorry and seal it. Would be curious how it works out for you. Good luck! Oh and I would do a test on a piece of scrap wood to make sure the sealer doesn’t affect the finish of the tea/vinegar. Thanks, will defeinitely let you know how it turns out! Is regular vinegar ok or does it have to be apple cider vinegar? Regular is good too. Good luck! 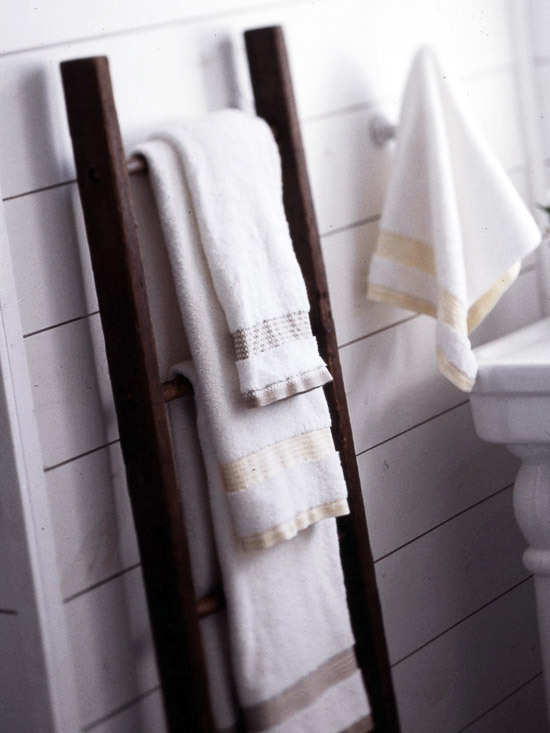 Your ladder looks great and perfect as a towel holder! Thanks for your tutorial and I’ve got this linked to my DIY towel racks post too today! Beautiful idea! Did you use something to stick the ladder on the floor to prevent from falling? It’s just resting there for now but we will probably have to anchor it to the wall once we have the baby. Love Love Love it!!! I plan to make one this weekend!! Did you cut the bottoms at an angle so it tilted straight back? If so, what was the angle you used? Thanks for the pin! Nope the bottom is straight and it just leans up against the wall. Good luck! I think we just filled up the jar shown. About 5-6 tea bags. Good luck! Hi. I noticed that you’ve hung white towel on it. Have you had any issues with the colour on the ladder staining the towels? I don’t put wet towels on it though. Oops. Just saw Janet’s post. Would like to know what she used to seal it and how it worked out for her. It’s likely there will be wet towels on my rack. Hi there, I’m not sure if your see this comment as its so long after your post. I’m used to the metric system (m and cm) and I just can’t figure out your measurements… what is 2- 8 ft? is it 2 and an eighth? Rungs are 16″. The 2-8 ft was meaning two 8 footers of the studs. Ah, thanks so much. I’m really looking forward to trying it out. This is the best towel ladder I’ve found so far! I used to work for PB and always wanted to have a ladder for my throws. The only think I changed was instead of starting the first hole at 2.5″ I started at 5″ but the rest is the same, again Thank you !!!!!!!!!!! I dont know how to post a picture here =( Otherwise ill post it . Looks very nice. I wondered if the ladder is secured to the wall in any way and if you cut the boards on the bottom to let it be more stable? It is not secured and the bottom isn’t cut but it is very stable. im sure you’ll build it yourself. I made it 2 weeks ago thanks to woodprix website. 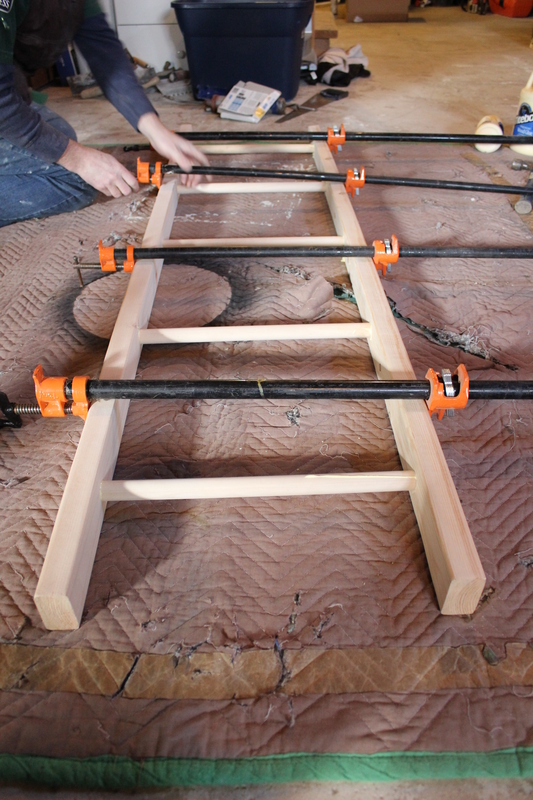 This looks easy to make your own ladder. I am sharing this to Pinterest. Looks great! Such an easy way to make a ladder. I am sharing this to Pinterest. Ours just rests against the wall and doesn’t fall. It’s not a high traffic area though. So any recommendations? I plan to have it up in a corner of the deck but pulling towels off and all the walking may cause it to slip any thoughts? I think you would have to secure it to the siding with brackets. You could try without to see if it slips first though. What type and size drill bit did you use? I am new to this and really want to try my first DIY. Im sorry I didn’t run into that problem. Maybe just wipe it down with a wet rag? This is great suggestion to adjust the luggage in small piece really informative.